Gold is the most famous metal for any kind of jewellery in India. Be it any occasion, traditional or formal events, wearing gold jewellery is not only a style statement but also a must do in today’s world. Gold being a sign of purity is worn on any auspicious event and is considered to be lucky. It would not only enhance your beauty but would also secure your future because of the high resale value that it has. So in this article, we are going to list down some of the latest gold necklace and gold earrings design so that you can make a wise and trendy purchase for yourself. Simple design- this is the most common yet classy design which is perfect for all occasions. 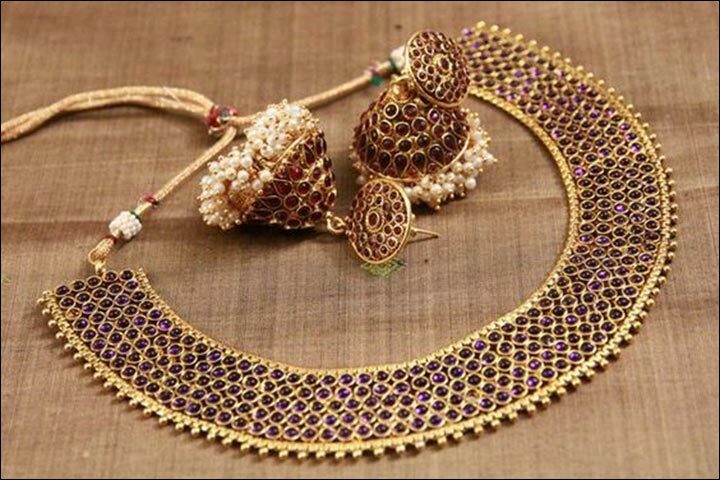 If you opt for a 10 gram gold necklace design that is simple, then you can wear it in any of your traditional events. They look simple yet classy and would go with all traditional wear especially saree. Wearing this you would need nothing more to beautify yourself. Light weight design- this is the perfect 10 gram gold necklace design that you could wear on birthday parties and small get together. They go very well with all kinds of Indian ethnic wear and would add more to the ethnicity of your dress. Choker necklace with Kundan- the gold chocker necklaces has been quite in trend now. They go very well not only with traditional wear like Sarees and Kurtis, but they are also equally attractive with cocktail gowns or any other party dress, even with the fully western one. You can choose to wear your dress matching with the color of the stone on the necklace or you can mix and contrast your dress and jewellery, the choice is entirely yours. Stud earrings- the gold stud earrings are perfect for a daily wear. Whether you are in a mood to dress up or dress down, this design of gold earrings would serve all your purposes. They go well with all kinds of attire and they are the best choice to be worn to office daily. They are even worn by men round the globe. Hoop earrings- these are the latest gold earrings design which are loved by women all over the world. This design of gold earrings goes very well will all kinds of denims, dresses and western wear. Hoops are perfect choice for a brunch out with your friends or for that evening get together where you do not want to dress up much but look very beautiful. You would get different sizes of these earrings depending on your choice. Jhumkas- Who does not love wearing jhumkas? They are classy, beautiful and looks great on any girl. It is the perfect thing to wear when you do not have much jewellery. A beautiful dress with a classy pair of jhumkas would do all the tricks for you. No Comments on "The best gold necklace and earring collections"